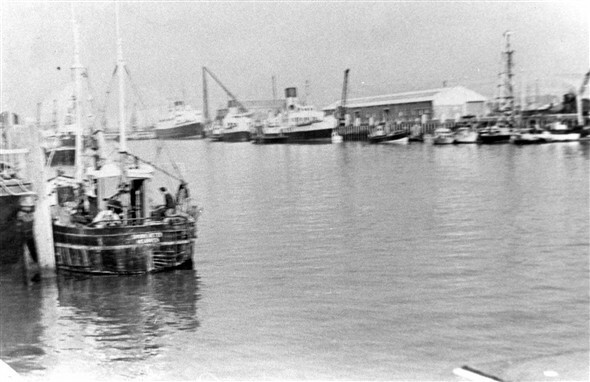 Looking up river from the Riverwall showing a ferry at the Marine workshops berth and two of the paddlers from the Portsmouth/Ryde crossing. Probably wintertime and laid up until the following summer season. This page was added by Colin Holden on 08/11/2008. A nice photo, with plenty of interest. Up at the Marine Shops is the St Patrick or St Andrew (sisters from the Irish Sea routes), and the two paddlers are indeed Ryde and Sandown from the IOW service. Just visible to the left of the masts of the fishing boat in the foreground is the dredger Ron Woolaway. At the right is a barge/pontoon with some form of derrick. Can't remember if the old Barrowhead had this at some point. The lieveries of the Railway ships make this pre-1965 and Colin's absolutely right that it's winter lay-up time.